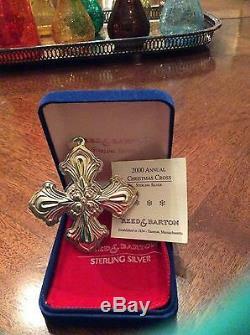 Beautiful annual Reed and Barton 2000 sterling silver Christmas Cross ornament in mint condition. Comes in blue velvet box that was the original box for 2000 and has the red ribbon and information leaflet included. This is a wonderful gift to give children year after year... And when they leave home they have wonderful ornaments to decorate their tree. In our family this has been a tradition for nieces for many years and they love it! As well, it's a beautiful gift for a wedding gift or for a child born in that particular year. This 30th edition is especially collectible as the new millinium ornament. 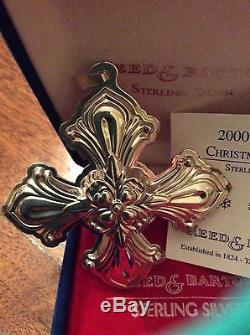 The item "2000 Reed and Barton Sterling Silver Christmas Cross Ornament - Mint" is in sale since Friday, November 27, 2015. This item is in the category "Collectibles\Holiday & Seasonal\Christmas\ Modern (1946-90)\Ornaments\Metal". The seller is "colormescarlett" and is located in Montgomery, Alabama. This item can be shipped to United States.